This is an example of how car enthusiasts could use SHOUTTAGs. They could use them to promote their cars' customizations at car shows or to sell their cars. Car clubs could use SHOUTTAGs to promote their clubs and list upcoming events. The old red FOR SALE sign or the hand written customization list on your $65,000 car just isn't cutting it. Tell other enthusiasts and possible buyers your story and what makes your car special. Stand out in a crowd. This is my pride and joy. The time has come to send her off to a new owner. 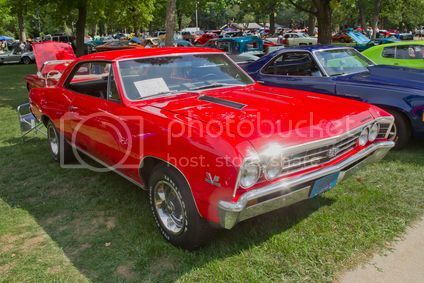 1967 Chevrolet Chevelle SS Custom - Classic Survivor. Rare Options. True 138 VIN -Mostly original some restored 1967 Chevrolet Chevelle Super Sport 2-door Hardtop Coupe. Rebuilt original matching numbers 396 c.i.325 HP V8 L35 engine. Paired with the original matching numbers Turbo Hydramatic 400 3-Speed automatic transmission. 12-Bolt rearend is original but unlike most SS packages does not have the Positraction option. It is repainted the original Ermine White body color with original factory black vinyl top with chrome trim as coded C-2. Features original factory-installed floor pans trunk pan and rocker panels. Unique factory column shifter and bench front seat. Factory Air Conditioner with nice cold air. Original Deluxe seat belts as coded 5Y. Also has the original factory tinted windows power steering with power disc brakes. The original black vinyl interior 761-A includes new front seat covers and headliner with new carpet. 14-inch Custom Ralley Wheels with Chrome trim rings are original with new raised white letter F70 equivalent tires. Includes original restored resurfaced and tuned Rochester Quadra-Jet carburetor re-chromed bumpers rebuilt alternator and new battery tray. Original brake Master cylinder has been repaired and transmission pan gasket replaced. It comes equipped with a Spare tire and original jack with covers. Has Original Delco push button AM radio but it is not working. Factory original front antenna Original aluminum windshield wipers and single Bowtie driver rear view mirror. Shows some rust through paint on hinge and inside bottom of driver door and a few bolt heads. Replacement OEM General Motors Approved front & back SS insignias hood grills pin stripes kit all still in boxes and Original stock air cleaner come with purchase. Factory original in-dash cigarette lighter and emergency brake do not work at this time. Clear title in hand. This is a must see Classic. Looks GREAT. Runs GREAT and a real head turner. Please Call 555-123-5342 . Located in Murrieta, California. Sold as is. No warranty.